An impedance of 50ohm is highlighted in the Field Components SMA 2 Hole Right Angle Female RG400 Cable Assemblies. The SMA Female Right Angle 2Hole Flange to SMA Male Reverse Polarity Right Angle is constructed using RG400 cable. 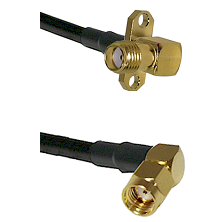 The SMA 2 Hole Right Angle Female RG400 Cable Assemblies RSMAF2-RG400-RPRSMAM-Length are precision manufactured using highest quality RF and Microwave coaxial connectors.